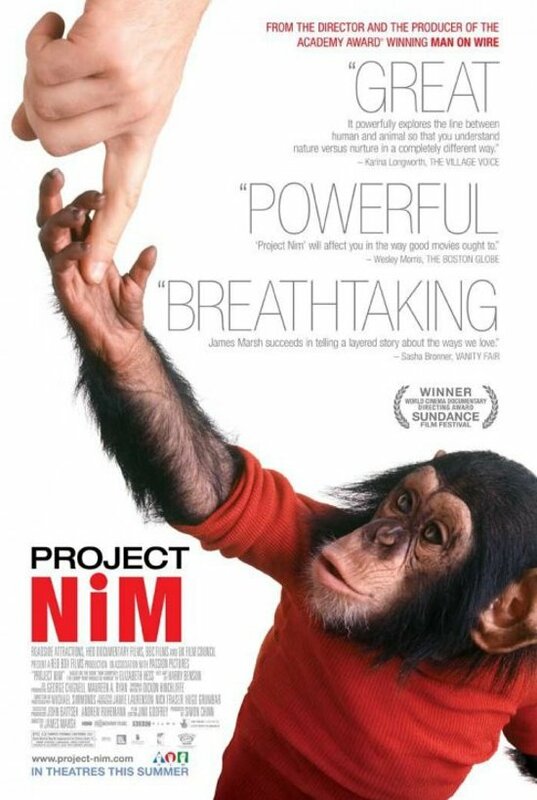 The newest documentary from Oscar winner James Marsh (Man on Wire) concerns a chimpanzee named Nim who was subjected to a series of linguistic experiments back in the 1970s. The goal was to test the nature versus nurture hypothesis by teaching an animal sign language to see if it could eventually construct full sentences of its own devising. Details on the success of the project are readily available online, but spoilers will hardly lessen the affecting impact of Nim’s controversial journey, which is marked by constantly changing hippie-esque mentors, a variety of contrasting environments, and several frightening instances of (un)predictable violence. The film is alternately cute (Nim has a fondness for kittens) and heartbreaking (Nim’s emotional reactions to his imposed circumstances resemble those of humans in a manner that overshadows his success at signing), but always interesting thanks to candid interviews with all manner of parties related to the life of this remarkable chimpanzee. Project Nim opens today at the Ritz at the Bourse.